The James L. Knight was crowded for the Laura Pausini Concert along with the special performance of Gente de Zona. The show was beyond amazing, and the fans couldn’t be happier by the whole show. We provided all the special effects and gave the wow factor for both artists performances. We did Sparkular Machines, Confetti Blowers, and CO2 Jets. Laura Pausini is a very well known artist in Miami and the rest of the world. This was one of many concerts that are expecting here across the USA. We had the pleasure to be a part of her show in Miami because we’re definitely the best at special effects in the city. Besides, Gente de Zona was there to open the show and to give a very fun performance along with Laura. The people went crazy since Gente de Zona is also one of the favorite bands in Miami. We displayed the most important moments of the show with the special effects. We used confetti blowers, that showered the entire venue and guests, and the moment looked picture perfect. 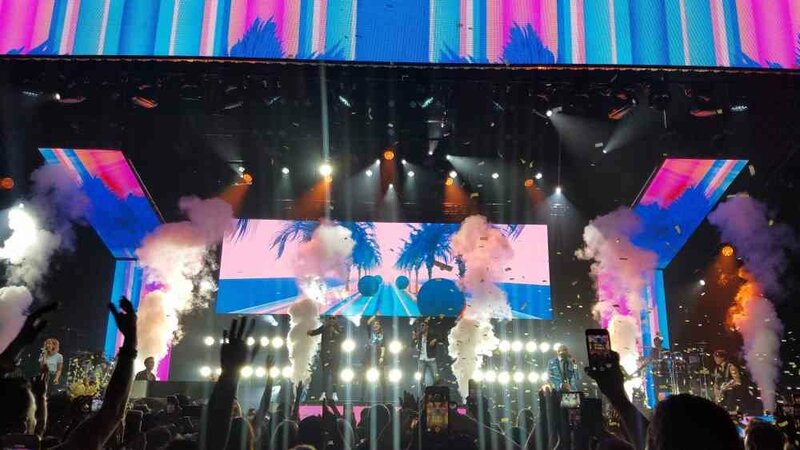 With Laura and Gente de Zona’s song “Nadie ha dicho”, we used CO2 Cryo Jets and Confetti. Those kinds of details always complement the artists’ talent and make the moment more exciting for everybody! But the main star of the show was the sparkular machines that popped during one of the most famous Laura’s songs “Inolvidable”. Overall, the show turned out amazing! Happy fans, happy artists and happy clients, that’s the most rewarding thing for us. Contact us to get your event’s full production with us! As a full event production company, we always strive to improve the quality and the customers’ satisfaction. Doesn’t matter how big or small is the event we’re working at, we’ll provide the best production services. We offer the full package: lighting, sound, fireworks, special effects and more unique ideas. We can handle any type of event! from concerts to corporate events, pool parties, festivals, birthdays, weddings, galas and more! Check out our social media to see pictures and videos from our latest events!